Ali Hochberg serves two roles at BIOS: she works half-time in the Development Office where she is a science writer, webmaster, and social media manager, and she also works half-time for Dr. Eric Hochberg on the COral Reef Airborne Laboratory (CORAL) project as the communications and media coordinator. She has an undergraduate degree from Eckerd College (St. Petersburg, FL) in environmental policy, with a minor in marine science, and a graduate certificate from the University of South Florida (Tampa, FL) in informal science education. 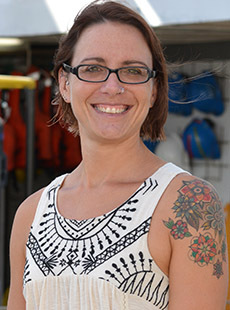 Prior to joining BIOS she worked as the education and outreach coordinator for the University of South Florida College of Marine Science Ocean Monitoring and Prediction Lab, the director of education and public programs at The Pier Aquarium, a marine wildlife observer on commercial dredging operations, and as a consultant for Marine Science Consultants of Hawaii. When not working, Ali is distance running, working out, or chasing her six-year old son and the family's new puppy.